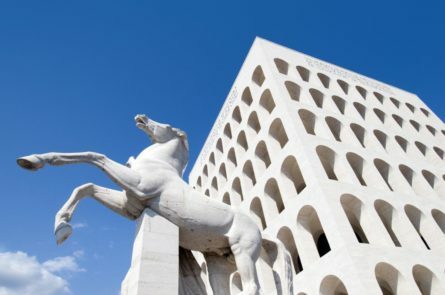 After Rome’s Imperial and Papal eras, Italian dictator Benito Mussolini referred to Fascism as the Terza Roma, or “Third Rome.” During this fascinating private tour in EUR, you’ll discover some of the iconic architecture that contributed to Mussolini’s vision, including the Palace of Italian Civilization and the Palace of the Congresses, both significant buildings during the period. Known as the “Square Colosseum” the Palace of Italian Civilization is iconic in its own right and has recently undergone restoration. You’ll also be able to see the construction of architect Massimiliano Fuksas’ fascinating and newly-opened New Congress Center, also known as “The Cloud.” The massive undertaking provides us with an opportunity to discuss the positive aspects and pitfalls of creating new, cutting-edge architecture in such an historical city. By dissecting the architecture you will learn how the urban landscape of Rome has reflected its changing history. You’ll also visit the Garbatella district, a planned garden-like community built in the 1920s and ’30s. Exploring these wide variety of neighborhoods allows you to compare and contrast the vast array of architectural styles present in Rome. If you wish, you can end your tour with a visit to the nearby gourmet department store, Eataly.